The Pull cord (Reepschnur) method is a seldom used tool that allows one to make full rope-length rappels with only one rope. A non-load bearing retrieval rope is used to pull the climbing rope down afterward. 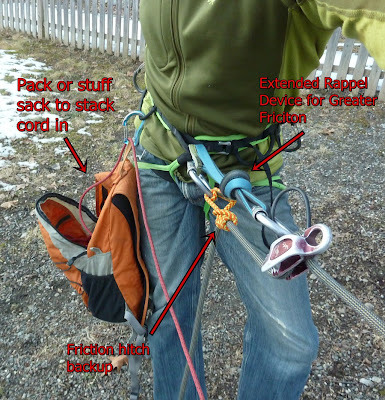 A pull cord, generally 5-6mm cord, paired with a skinny single rope makes the lightest full-length rappelling combination. I use a pull cord routinely during the winter months, and frequently use it year-round in an alpine environment as well. Like all other techniques, there are advantages and disadvantages to this method. Knowing when and how to use a pull cord safely is essential. 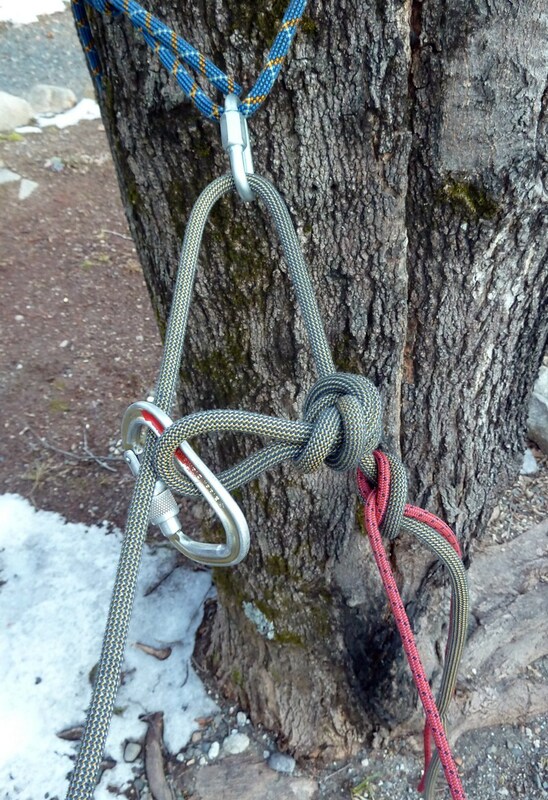 A single rope is often easier to manage than a two rope system (half or twin), especially when guiding or climbing easier routes. It's lightweight - This is the biggest advantage in my book. My 50-meter pull cord is only a little larger than a 1-liter water bottle, and similar in weight. When paired with an 8.9mm single rope you have a very lightweight alpine/ice rope setup. When the approaches are long and you're counting ounces this is a good way to shave weight and bulk from your kit. It's a good system to use if you think most rappels will be short but there's a chance you might have to make a few longer ones. If set up improperly you could die. There was high-profile fatality in Yosemite a few years ago due to an improper pull-cord setup. 60m of very thin cord is difficult to manage. Full-length rappels on a single 8.9 millimeter rope are zippy. 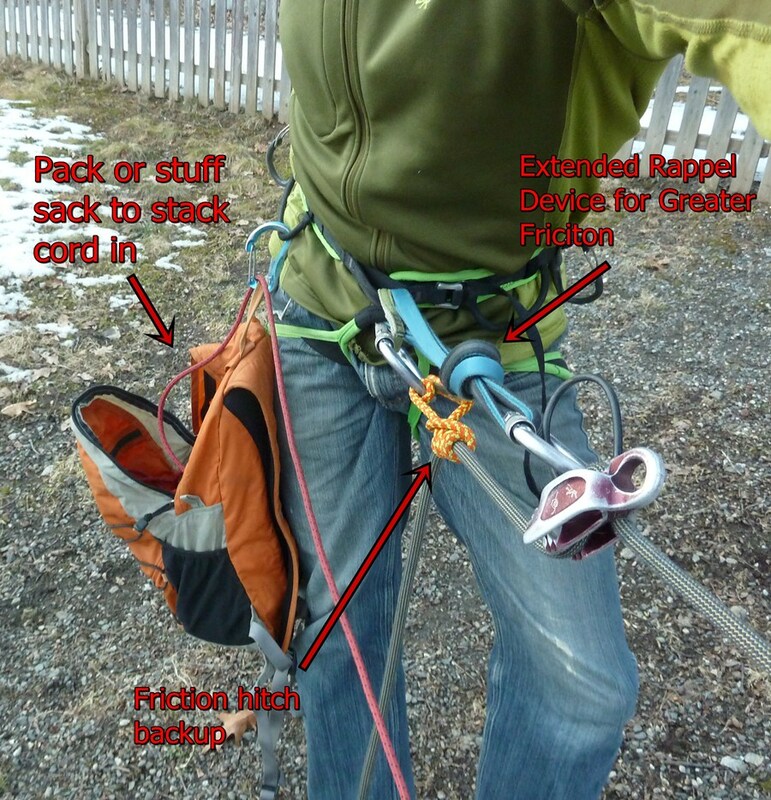 Use a friction hitch to back up your rappel device. The knots and carabiner used to block the rope can snag easily during your retrieval effort. As you can see, the parameters for using a pull cord are narrower than the parameters for using a regular two-rope combination. It's snaggy, has very little friction and is a higher maintenance setup. However, if you work inside these parameters and stay organized it's a very effective tool. When do I use a pull cord for rappelling? I use one a lot for long rappels in the winter, and I use them occasionally for shorter rappels in a rock and alpine environment. I have a 50ish-meter 6-millimeter pull cord and a 40-meter 5-millimeter pull cord. The long one gets used in the winter and in certain rock environments. The shorter cord gets used when I want to bring a short (30-40 meter) cord for certain alpine climbs that might involve rappelling during the descent. Ice has very low friction, making rope retrieval after rappelling easy. 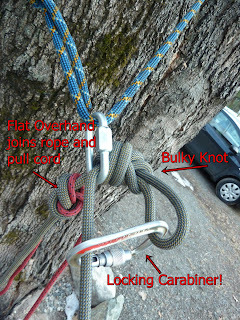 When using the pull cord on rock or in vegetation the knot and carabiner can get snagged on tree branches, rock horns, and in cracks very easily. Care must be taken to avoid having to jug back up the rope or lead up to the jammed knot on a skinny 6mm cord. If it seems like the ropes may snag I usually opt to make two shorter rappels instead. When using a pull cord you are essentially rappelling using a knot to block the rope on one side of the rings on a rappel anchor. Therefore, it is imperative you use a large knot that won't pull through the rings. As a back up there's always a separate bight knot with a locking carabiner clipped back to the rappel side of the climbing rope. In my experience the best knot for blocking is the figure nine (one more half-turn than a figure eight) which is bulky but unties easily. 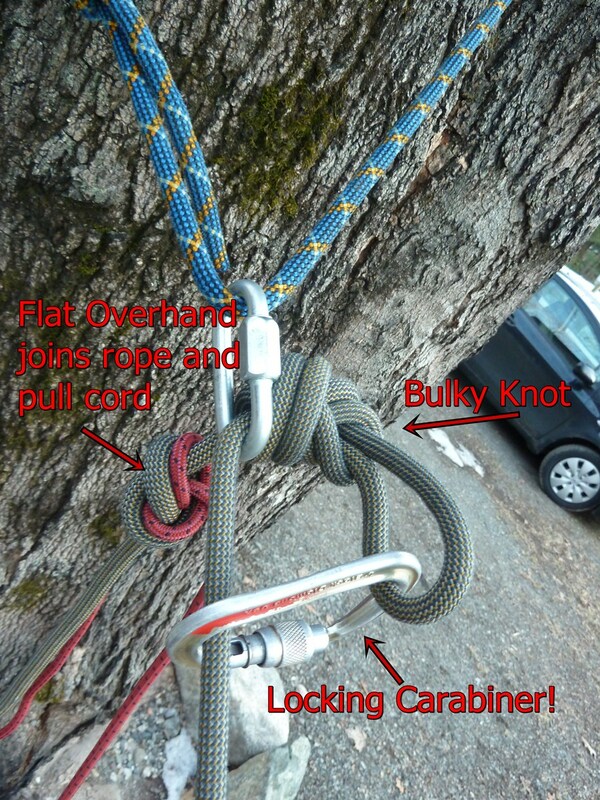 A few of the climbing magazines debriefed the Yosemite reepschnur accident several years ago and suggested using a flat overhand (European Death Knot) to block the rope. I have seen this particular knot pull through aluminum rappel rings on more than one occasion, leading me to believe this is a less-than-ideal setup. Why magazines don't fact check their info before it's published is beyond me and beyond the scope of this post (to see the identical poor setups in both mags click here and here). The bottom line here is this - if you want your rope to pull afterward use a bulky knot that won't get stuck in the rings or quick links. You don't need to have rings on the anchor for this technique to work as long as the system is backed up by the bight knot and locking carabiner, however pulling the ropes afterward can be more difficult. The knot may slip to the wrong side of the webbing and there is usually greater friction without a ring on the anchor. I try to stay organized when using this system. There are a few ways to avoid having the pull cord become a complete bird's nest. My normal system, and one that works well on multipitch ice routes, is to carry the pull cord up the route in the same small pack in which I carry my parka. It get's stacked in the bottom of the bag, below my belay parka.When I'm ready to rappel I set up the rappel rope and pull cord. I'll clip the small pack to a harness gear loop. As I rappel the pull cord flows neatly out of the pile stacked in my pack. If I'm using a pull cord on an alpine route a harness stuff sack works brilliantly and is lighter than a 16-liter backpack. When I want to pull the cord and retrieve my climbing rope one person pulls while the other person stacks the cord back in the pack or stuff sack. This way the pull cord never gets tangled or unorganized. Frankenstein Cliff, NH - If you don't walk off in the amptheater this technique works well. Catskill Ravines - When you start thinking about places where top belays are common yet you still need to rappel there are endless possibilities. You can bring a 35-meter climbing rope and a 35-meter 5-millimeter pull cord for a very lightweight backcountry alpine setup.